Keys respond predictably. The action speaks effortlessly. Scales and passages are surprisingly even. Those are the hallmarks of a touch-optimized action. Mario Igrec has developed Practical Touch™, a system for grand piano touch analysis and redesign, to be able to reproduce the touch of the finest modern pianos. Based on the touch metrology of David Stanwood and on recent research on action inertia, but providing a time-saving, pragmatic methodology, Practical Touch offers all the advantages of competing techniques at a fraction of the time—and cost. By combining this technology with his piano playing experience, Mario transforms the piano action into a superbly responsive mechanism that provides unsurpassed uniformity and control, and just enough inertial resistance to even out your passagework and expand the expressive range of even the loudest dynamics. A touch optimization service requires cleaning and lubricating the action and keyboard, addressing variations in friction, and regulating the action. Without adjusting hammer and shank weights. This technique is appropriate for pianos with relatively new, high-quality hammers that the owner likes and that won't need to be replaced for years to come. The hammers remain on the action rack, their alignment with strings and their voicing are not disturbed, and only minor hammer weight modifications are performed. Even though the hammers do vary in weight somewhat, the result is a very high degree of control in soft playing and a sense of great mechanical and tonal evenness. The variations in hammer weight and key leading that remain are both tonally and mechanically well below the threshold of perception for most pianists. Smoothing hammer and shank weights provides exceptional consistency in the action's inertial response. 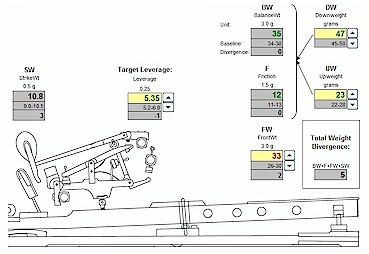 After we analyze the action, we calculate the optimal hammer weights and choose replacement parts based on their geometry and effect on the action leverage ratio. We test sample hammers and action parts, measure the touch response, and then rebuild the action with new parts. This option is more expensive, but provides the ultimate touch response with unprecedented evenness and control.